From the 1940s, Antoni Tàpies (b. 1923, Barcelona; d. 2012, Barcelona) has developed a strong visual language through a wide range of sources that coalesce into a complex fusion of materials, gestures, and symbols. Co-founder of the magazine Dau al Set in 1948, and influenced by Miró and Klee, he became increasingly interested in iconographic and magical subjects. He gradually began to incorporate geometrical elements and colour studies leading to an interest in matter through the use of heavily textured canvases of great expressive and communicative possibilities. Tàpies achieved international recognition by the mid-1950s. 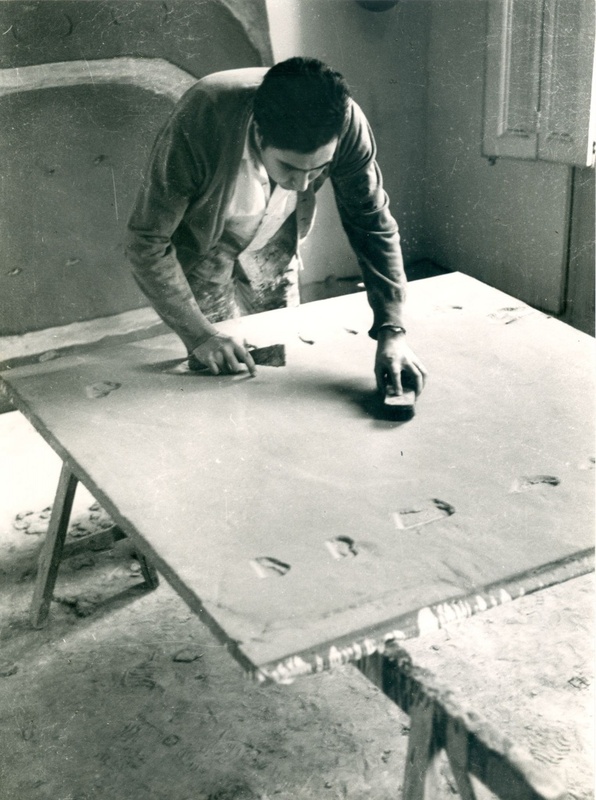 In the 1960s, he began incorporating new iconographic elements (writing, signs, anthropomorphic elements, footprints and references to the Catalan situation), and new technical methods (new surfaces, use of everyday objects and varnish). Tàpies’ pictorial language has continued to develop ever since, resulting in a creative and productive body of work in painting, sculpture, and assemblage, that is admired throughout the world. Important solo exhibitions include retrospectives at the Solomon R. Guggenheim Museum, New York (1962 and 1995); Musée d’Art Moderne de la Ville de Paris (1973); Nationalgalerie, Berlin (1974); Albright-Knox Art Gallery, Buffalo, New York, which later traveled to Chicago, San Antonio, Iowa, and Montreal (1977); and Museo Nacional Centro de Arte Reina Sofía, Madrid (1990). In 1990 he was awarded with Premio Príncipe de Asturias de las Artes, followed by the Praemium Imperiale Award from Japan. Tàpies has participated in three Venice Biennale exhibitions (1952, 1954, 1958) prior to being selected to represent Spain at the 45th Venice Biennale in 1993, during which he won the Award Golden Lion. 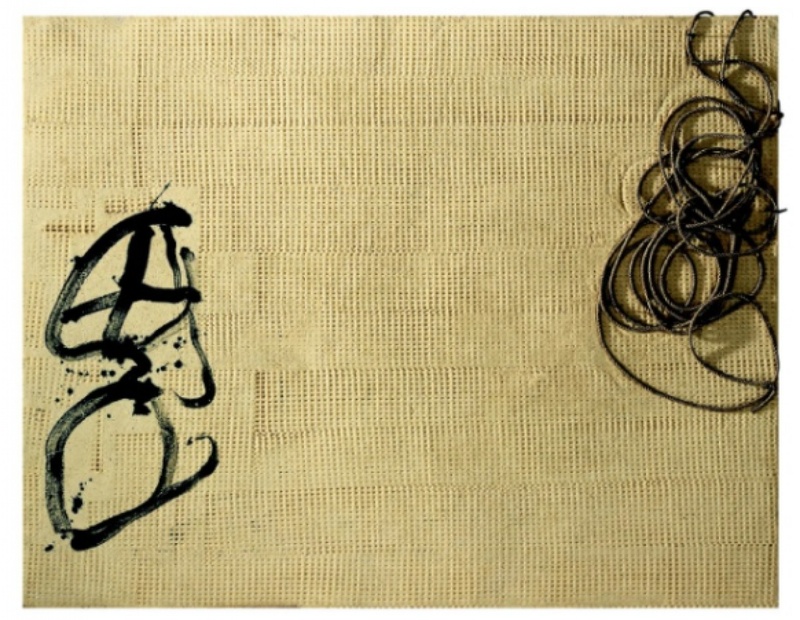 In 2010-2011 he was the subject of Secret Scribbles at the Contemporary Arts Center in Cincinnati, and in 2013 of a series of major museum surveys: Contra Tàpies and Tàpies: Des de l’interior at the Fundació Antoni Tàpies, the latter in collaboration with MNAC Museu Nacional d’Art de Catalunya; TÀPIES: The eye of the artist, Palazzo Fortuny, Venice coinciding with the Venice Biennale; and Antoni Tàpies: From Object to Sculpture, 1964– 2009, Guggenheim Museum Bilbao, Spain. His work is included in numerous public and private collections internationally including Tate Galleries, UK; The Museum of Modern Art, New York; Galleria Nazionale d’Arte Moderna, Rome; Le Centre Pompidou, Paris; Stedelijk Museum, Amsterdam; and the Museum of Contemporary Art, Los Angeles. In parallel to his artistic production, Tàpies is also the author of numerous publications: La pràctica de l’art (1970), L’art contra l’estètica (1974), Memòria personal (1977), La realitat com a art (1982), Per un art modern i progressista (1985), Valor de l’art (1993) and L’art i els seus llocs (1999).